The lustration law took effect in Ukraine on Wednesday after it was published by the parliament newspaper Holos Ukrainy. The bill passed by the Verkhovna Rada on September 16 was signed by Ukrainian President Petro Poroshenko into law on October 9. The law outlines the legal and organizational framework for the inspection of civil servants and local government staff in order to restore confidence in the government and create conditions for the construction of a new system of government in accordance with European standards, the president's press service reported. As reported, the Verkhovna Rada adopted the lustration bill at the third attempt on September 16. Parliament Speaker Oleksandr Turchynov signed the document on September 25. Ukrainian Premier Arseniy Yatseniuk said that about 1 million persons would come within the purview of this law. He said that all chain of command would fall under this law. Ukraine's Prosecutor General Vitaliy Yarema said that he lustration law passed by the Verkhovna Rada complies neither with the Ukrainian Constitution, nor international law, and its enactment will entail negative consequences. Yuriy Derevianko, one of the authors of the bill and a member of the working group that prepared the bill for second reading, said the law will apply to all public servants and local self-government officials without exception. The law also prohibits "Yanukovych-era officials from working in public administration for ten years and others for five years." "The ban on working on certain positions for ten years will apply to people who worked in a position (positions) for a total of at least one year in the period between February 25, 2010 and February 22, 2014," Derevianko said. Among the people on the list are the president, the prime minister, the first deputy prime minister, deputy prime ministers, ministers, the heads of the central executive administration body that is not part of the Cabinet of Ministers, the heads of the National Bank, the Anti-Monopoly Committee, the State Property Fund, the State Committee on Television and Radio Broadcasting, and their first deputies. The ban will also apply to the head of the General Staff: the Commander-in-Chief of the Ukrainian Armed Forces, the commander of the Ground Forces of the Ukrainian Armed Forces, the commander of the Air Force of the Ukrainian Armed Forces, the commander of the Navy of the Ukrainian Armed Forces, and their first deputies. 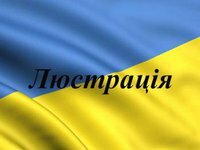 The law will also apply to the heads of the regional administrations, all their deputies, and all heads of the district state administrations who worked during Viktor Yanukovych's presidency for a total of at least one year, and also those who worked during the Maidan period and did not resign of their own accord. Derevianko said officials will be lustrated if they worked in a position (positions) in the period between November 21, 2014 and February 22, 2014 and did not resign of their own accord, were elected and worked in high positions in the Soviet Communist Party, were permanent workers or secret agents of the Soviet KGB, the Main Intelligence Department of the Soviet Defense Ministry, graduated from higher education establishments of the Soviet KGB (except for technical specializations), worked with the special services of foreign countries as secret informers or carried out events aimed at sabotaging the foundations of Ukraine's national security, defense or territorial integrity by their actions or lack thereof, made public calls for violations of the territorial integrity and sovereignty of Ukraine, or fanned ethnic feud. The law will take effect on the day of its official publication.